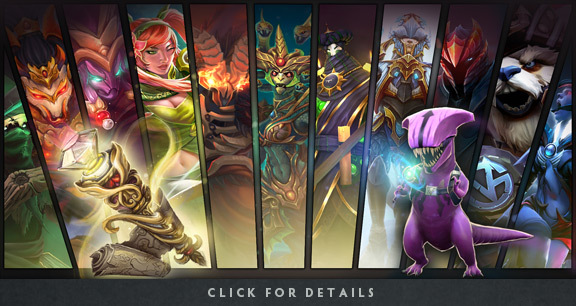 Available for purchase exclusively to Compendium owners, the International 2015 Collector’s Cache costs $1.99 and gives you another chance to contribute to The International prize pool as you claim 11 community-created, Mythical sets. The Cache also has a 1 in 250 chance to contain the Immortal Faceless Rex courier. The Collector’s Cache will only be sold until the end of The International. Opening a Collector’s Cache also gives you several ways to increase your Compendium level. The first time you open a Cache will earn you 2 levels, when you open 5 Caches you’ll earn 5 levels, and you’ll earn 11 levels when you open 11 Caches. There’s also a chance that a Cache will contain an item that grants 11 Compendium levels. Additionally, each set from the Collector’s Cache can be recycled for two levels. These sets won’t be sold elsewhere, and won’t be available on the market or for trade, though they can each be gifted once. The Faceless Rex courier, however, is fully tradable and marketable.